Aurora has been growing rapidly in an effort to position themselves on the forefront of the Canadian cannabis market. Recent debt offerings have pushed the company's long-term debt to potentially exceed $1 billion. Additional debt or dilution is very possible as a result of the recent shelf prospectus filing and Aurora Sun expansion. Note: All amounts expressed are in Canadian Dollars unless otherwise noted. Aurora Cannabis (ACB) (TSX: ACB.TO) continues to finance their operations and strategic growth at a concerning rate. Their balance sheet is becoming crowded with convertible debt, and share-based deals are adding dilution to a company that many feel is already too diluted. Aurora is clearly trying to create shareholder value by growing at a rapid pace, and as a result of these moves, additional financing has been required. This article will dive into the current debt situation for Aurora Cannabis, which is seemingly growing at an uncomfortable pace. The company has been one of the most active companies in the cannabis industry with respect to mergers, acquisitions, and partnerships. It is not uncommon to see a headline from Aurora Cannabis stating that they have invested or partnered with another company in the cannabis space. Additionally, the benefits and returns of these investments have not come to fruition in terms of being realized in their financial statements. The graphic below shows the magnitude of the deals completed. The largest component of ACB's long-term debt is convertible debentures amounting to approximately $201.6M as of December 31, 2018. A breakdown of these convertible debentures is shown below. The sole component of the convertible debentures is the March 2018 offering. The debentures are convertible at a price of $13.05 per share and there is a forced conversion at $17 per share (if VWAP is $17 per share for 10 consecutive trading days). Given the current share price of approximately $12 per share, the debentures are far off of the forced conversion point of $17 per share. The accretion on these debentures was $11.1M for the 6-month period. The interest rate on the debentures is 5% locking in either a healthy interest payment or eventual dilution through share conversion. The company was not done with their financing activities in an effort to keep their growth activities on track. Subsequent to quarter-end, the company continued to extend themselves by moving forward with a $345M USD convertible debenture offering. At the time of the issuance, the premium on the debt conversion was 10% based on the stock price of $7.23 USD at the time. The interest rate is around what we would expect based on similar deals, prevailing at 5.5% per year. This deal is presumably going to bring the total level of long-term debt upwards of $1 billion when Aurora reports their March 31, 2019, financial statements. The breakdown of ACB's loans and borrowings as of December 31, 2018, is shown below. The notes to the financial statements also reference that the entire credit facility can be upsized to $250M based on certain conditions. It is, however, unlikely that this would occur until the conditions allowing them to draw on Facility A were clearly met. Just last week, Aurora Cannabis announced that they had filed for a preliminary based shelf prospectus. This could signal that more debt could be added to the balance sheet in the near to mid future. Executive Chairman Michael Singer provided the following commentary on the filing. Although we have no immediate intention of drawing capital against this Shelf Prospectus, we have introduced this option as a prudent and long-term strategic measure to provide us with flexibility in access to growth capital, if or when required, to continue executing on our global expansion and partnering strategy..."
This week, Aurora Cannabis announced they were going to increase the capacity of their Aurora Sun facility. The increased capacity will bring the total size of the facility to 1.62M square feet which is a 33% increase from what was originally planned. 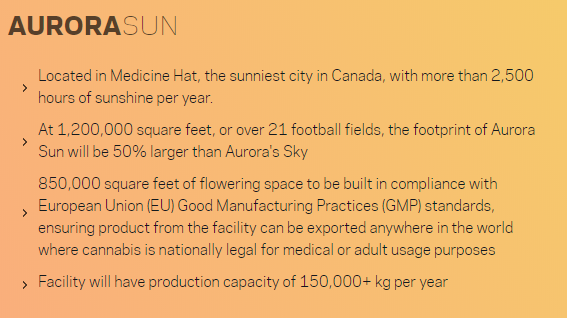 The increased scale of Aurora Sun reflects our expectations for the long-term growth in global demand, especially the higher margin international medical markets which will be faced with significant supply shortages for the foreseeable future." No indication was given if this will result in additional capital spending, but given the scale of the facility, it would be hard to see a situation where costs additional capital expenditures are not realized. The recent convertible debenture offering discussed above could be an option to finance the expansion, however, with no indication of what the additional costs would be, it is difficult to identify the particular source of financing. High levels of debt are problematic for the company as it could handcuff Aurora Cannabis from further expansion opportunities and strategic investments. As their debt levels increase, so does their borrowing costs. It is important to highlight that we have been in a period of low interest rates and financing has been generally quite inexpensive. If current economic conditions change towards an environment where rates are rising, companies like Aurora Cannabis will have to raise debt at rates that are more unfavorable to them. The debt issue becomes increasingly problematic when reviewed in part with the company's negative operating cash flow. For the 6-month period ended December 31, 2018, the Aurora had negative operating cash flow of almost $133M. This is unsettling both on its own and when factored into the potential need for additional financing in the future. Cash is seemingly being spent aggressively at such levels that could make it unsustainable for Aurora Cannabis to execute on their strategy and become profitable. From a forward-looking perspective, Aurora Cannabis' strategic acquisitions and partnerships could make them a leader in the cannabis sector. Their growth strategy could prove worthwhile in the future, but currently, it has come with the added cost of debt and dilution. Given the scale and composition of Aurora Cannabis' debt, there are too many unknowns to recommend the company as an investment at these price levels. The dilution remains a constant concern, and the recently filed shelf prospectus and facility expansion could increase both debt and share dilution. There are too many red flags at this point to feel like the company is going to be cash flow positive in the short term and not have to look to market for additional financing. Aurora's financing decisions ultimately leave much to be desired from an investment point of view and add more financial uncertainty to their long-term growth plans. Additional disclosure: Disclaimer: This article is for information purposes only. Please do your own research and due diligence and consult a financial advisor and/or tax professional if necessary before making any investment decisions.